Oh my. 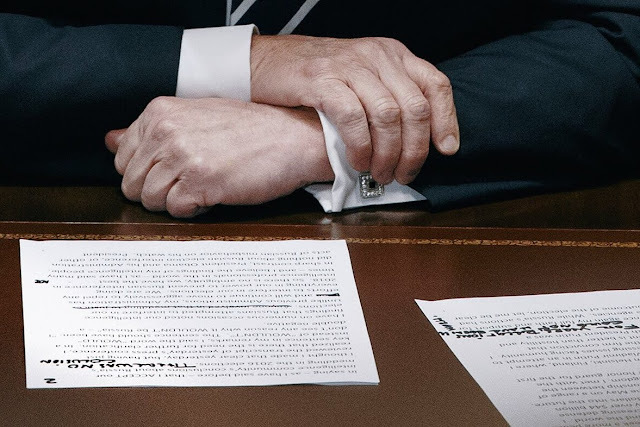 Sharp-eyed CNBC reporter Christina Wilkie noticed that in a photo of the written prepared remarks of Trump's lame rollback of his catastrophic Helsinki news conference, there was a line that was crossed out. But it wasn't crossed out all the way, you could still see what it said in the image. It says, "Anyone involved in that meddling to justice." (Obviously, the words "should be brought to" can be interpolated there.) So now we know that Trump specifically does not want to see the people who attacked the U.S. brought to justice. Gee, I wonder why. On a not-wholly-unrelated note, former CIA director John Brennan pointed out that having a private meeting with Putin on his home turf with no one else in the room might not have been the brightest thing Donald Trump has ever done because Putin may have recorded the private conversation (gee, ya think?) and Trump may have said something stupid (gee, ya think?) that Putin can now use as leverage against him. A worst-case scenario is starting to look frighteningly plausible. Now the news media is exposing their own espionage. Why would he cross it out? Could it be that the Mueller indictments are just ... stupid? That there is no way those spies are leaving Russia? That Mueller is trying to use the court system against foreign spies, which has historically been handled by foreign policy, diplomacy, and our own spies? What if one of those spies is a double agent? Mueller could be causing great harm to national security. As for the Russians recording the meeting, don’t you think the U.S. would record it as well? Don’t you think President Trump would know of the possibility of the Russians recording it? Otherwise, Ron, you need to escape from the fantasyland of the Democrat alternate reality. Walk towards purple until you smell East. Then jump down scratchy until you hear licorice. Luke will be there and grab you with a hook. President Trump was the owner of a real estate and construction firm, a promoter, and a showman. He ran for President and won. > don’t you think the U.S. would record it as well? How? There was no one in the room but Trump, Putin, and two interpreters. And it was Putin's room. Putin: You know, Donnie, I have a tape of out conversation the other day, so I could blow the lid of your whole operation. Remember when we talked about the loans? The money laundering? How we we're planning to take care of Manafort? All on tape. Trump: Oh yeah? Well guess what, Vlad, we have it all on tape too! > Don’t you think President Trump would know of the possibility of the Russians recording it? I'm sure he was warned. But he can't help saying stupid things when there are news cameras in his face. Do you really think he can avoid saying stupid things when he's alone in a room with Putin? > He ran for President and won. With the help of an unfriendly foreign power. As Trump himself has now admitted on the record. Even if the campaign did not actively collude (and that remains to be seen), the Russians *did* interfere in the election (as Trump has now admitted) and they *did* support Trump (as Putin said on the record during the Helsinki news conference). > That’s all there is to it. Sure, if you don't care that our president is possibly beholden to an unfriendly foreign power. Seriously, Publius, you seem like a patriot. How can you close your eyes to this? Are you really willing to surrender to the Russians without a shot fired just to overturn Roe v. Wade?